Richard Atack Construction wins Gold!! Builders participating in this year’s Parade of Homes were honored Wednesday at The Westin Richmond hotel with awards presented in 19 categories from the Home Building Association of Richmond, prior to the start of the annual open house event on Saturday.The association’s signature event this year features 90 new homes throughout the area constructed by 36 builders. The featured homes, which will be open for viewing from noon to 5 p.m. the first four weekends in October, are located in Richmond and Chesterfield, Hanover, Henrico, King William, New Kent and Powhatan counties. Prices range from the $200,000s to more than $1.2 million. StyleCraft Homes of Henrico County was the most honored builder with eight awards, including two top Gold awards for best home in the Furnished Townhome and Condominium Under $225,000 category and Furnished Single-Family Detached $740,000-$800,000 category. Ryan Homes, a national builder with a local office in Chesterfield County, received seven awards for its entries, including a Gold award for the top home entry in the Furnished Townhome and Condominium $240,000-$290,000 category. Other big winners were Richard Atack Construction of Henrico County, Main Street Homes of Chesterfield County and Shurm Homes of Hanover County. Each received six awards for their Parade of Home entries. Among homes listed for more than $900,000, Southern Traditions won the Gold award in the Unfurnished Single-Family Detached $900,000-$1 million category. Other high-end home Gold award recipients were Ray A. Williams Custom Homes of Midlothian in the Unfurnished Single-Family Detached $1.15 million-$1.25 million category, Homeplaces Ltd. in Henrico in the Furnished Single-Family Detached $1.09 million-$1.2 million category and Richard Atack Construction in the Furnished Single-Family Detached Over $1.2 million category. 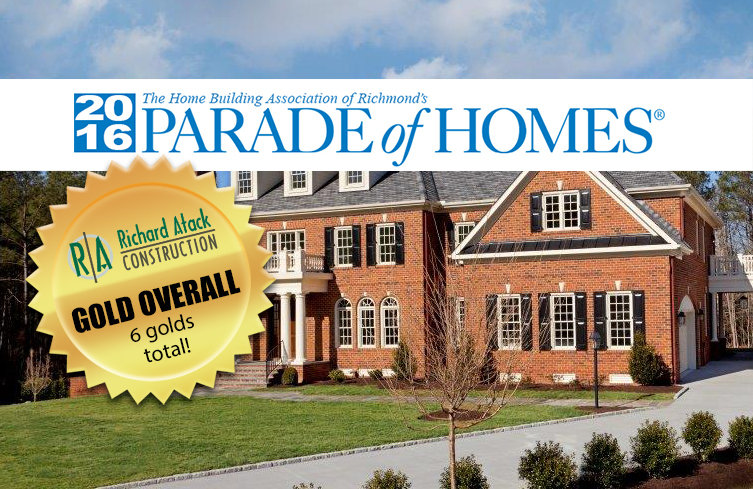 The full list of Parade of Homes award winners and a map of all houses in this year’s event are available at richmondparadeofhomes.com.